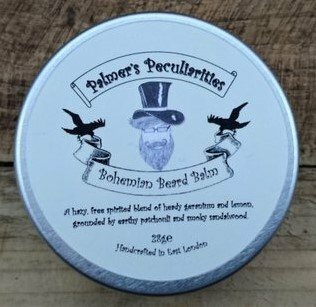 The Palmer’s Peculiarities Bohemian Beard Balm, is an all natural, small batch and vegan friendly beard balm. I love the scent, it is a blend of Patchouli, Sandalwood, Lemon, Geranium, Tea Tree Oil and it has been blended very well. It is floral and very very slightly zesty and the sandalwood backs that up and it really is a delight! The base for the balm is Shea Butter, Jojoba Oil, Grapeseed Oil, Candelilla Wax, Cocoa Butter and Vitamin E, unfortunately it is very grainy, it feels as though it has sand in it and usually with a grainy balm this means working it for longer in your hand. However this is so fine and I found that I was working the balm into my skin and the grain was still there and so I had to apply it like that. It has left my beard feeling softer, it does have a nice hold and the grainy particles are not very noticeable but run your fingers through your beard and you will get those grainy particles and it is a real shame. The balm comes in a 30ml screw top tin and costs £12.99 from the website and so it isn’t the best priced balm, you can get some 50ml and 60ml hand-made balms for around that price.